JNN 03 July 2014 New York : The United States has ordered the enhancement of security measures at selected overseas airports with nonstop flights to the country, saying terrorist groups are planning to bomb US-bound flights. On Wednesday, the US Department of Homeland Security said “enhanced security measures” would be implemented “at certain overseas airports with direct flights into the United States” over the next few days. The move comes during the summer travel season and days before the July 4 holiday. US officials who spoke to Reuters on condition of anonymity said the new security measures would include additional inspections of passengers’ shoes and property. They also said that the US had legal authority to order new security requirements at the selected airports because the flights go directly to the United States. “We are sharing recent and relevant information with our foreign allies and are consulting the aviation industry,” said DHS Secretary Jeh Johnson in a statement. According to the US officials, al-Qaeda-affiliated groups like the al-Nusra Front, an al-Qaeda offshoot which is fighting the Syrian government, are believed to be working to develop explosives that could avoid detection by current airport screening systems. Washington’s main concern is that militants with Western passports can blow up US-bound planes. The United States has repeatedly raised concerns about the threat posed by terrorist militants in Syria and Iraq to America. Obama’s former ambassador to Iraq, Ryan Crocker, also said last month that “we would be foolish to think” that ISIL militants would not plan attacks against the US. “This is a more formidable force than Osama bin Laden’s group that brought us 9/11. Its fighters are experienced, completely committed to their cause, well armed and well financed. As many as 2,000 of them hold Western passports, including U.S. ones, so there’s no need for visas,” wrote Crocker in an op-ed for The Washington Post which was published on June 19. Washington’s concerns come as several reports and observers have said these terrorist militants in Iraq and Syria have been funded, trained, and armed by the United States. In a phone interview with Press TV on Monday, Wayne Madsen, an American investigative journalist, said that CIA director John Brennan who is “a known Saudiphile” has played a key role in the creation and rise of the ISIL. British authorities plan to tighten security at airports across the UK following a similar move by the US based on fears that foreign-backed terrorists in Syria and Yemen may have developed explosives that may be smuggled onto planes. 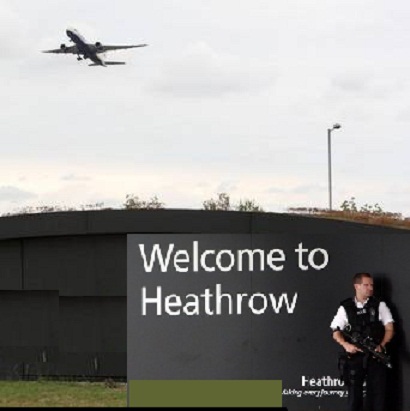 The UK’s Department for Transport (DfT) announced on Wednesday night that it would “step up some of our aviation security measures” following the warning from US security chiefs, the Guardian reported. US authorities had announced earlier that they plan to increase security for their aviation traffic at European airports following intelligence that al-Qaeda-linked operatives in Syria and Yemen have collaborated to develop bombs that would avoid detection at airports in a bid to bring down airplanes. However, the American officials did not elaborate on which airports or countries would be affected. Meanwhile, the DfT confirmed that aviation in Britain would be affected but declined to elaborate on what extra measures would be in place. It is believed that they would include more random screening of passengers and tighter scrutiny of footwear, mobile phones and computers. Moreover, a DfT spokesman further stated that the changes would not cause significant disruption to passengers and the threat level remained “substantial,” which means an attack was a strong possibility. “We have taken the decision to step up some of our aviation security measures. For obvious reasons we will not be commenting in detail on those changes,” he said. A woman in the US state of Colorado faces federal charges of trying to aid terrorist militants from the so-called Islamic State of Iraq and the Levant. Conley had met the Tunisian militant over the Internet and had joined a military career exploration program in order to learn US military tactics and train ISIL militants in those tactics. “Conley stated that she joined the U.S. Army Explorers to be trained in U.S. military tactics and in firearms,” officials said in court documents. She was arrested at Denver International Airport on April 8 as she was about to board the first of a series of flights that would take her to the Turkish border with Syria where she could join the militants. Takfiri ISIL militants – a radical al-Qaeda offshoot that enjoys support from loyalists of Iraq’s former Baathist regime – have taken control of some parts of Syria and Iraq. Last month, two Texans – Michael Todd Wolfe and Rahatul Ashikim Khan – were also arrested by federal authorities for “attempting to provide material support to terrorists” both within US borders and inside Syria. While several reports, observers, and even some US officials including Sen. Rand Paul (R-Kentucky) have said the terrorist militants in Iraq and Syria have been funded, trained, and armed by Washington, US officials have repeatedly raised concerns about the threat posed by these militants to America. Meanwhile, on Wednesday, the US Department of Homeland Security ordered the enhancement of security measures at selected overseas airports with direct flights to the US, saying al-Qaeda-affiliated groups like the al-Nusra Front, an al-Qaeda offshoot which is fighting the Syrian government, are planning to bomb US-bound flights. This entry was posted in America, Europe, United States and tagged Syria, United States, US Department of Homeland Security. Bookmark the permalink.